Last Wednesday at Ohavi Zedek Synagogue in Burlington, Yvette Rainville asked her class of English language learners, "What's the weather like today?" Khina Monger furrowed her brow, deep in concentration, as she watched the Catholic nun write "It is sunny and cool" on the blackboard. The murmurs in the room grew louder as the students began to read the sentence in overlapping voices. Though the heater was working, Monger, 59, had on her baby-pink beanie and puffy gray jacket with its faux-fur-lined hood. She removed her jacket on Rainville's suggestion but continued to wear her fleece. The Bhutanese woman has lived in the Green Mountain State since 2010, but she's still not used to the cold. As Monger sat listening attentively to her classmates, the pint-size grandmother swung her legs, her black shoes brushing the floor. Since Monger arrived in Vermont five years ago, she's been attending English classes at the synagogue on North Prospect Street four times a week; Rainville called her Bhutanese student a "regular." The lessons, organized by the Vermont Refugee Resettlement Program, are designed for refugees and asylees between the ages of 17 and 65. It's vital that newcomers pick up English language skills so they can adapt to the social, economic and cultural norms of their new home, said Ashraf Alamatouri, the English-language coordinator at VRRP. For many older refugees who, like Monger, aren't literate in their native language, this is a tall order. While younger refugees may have greater visibility, many aspects of integration into a new culture are particularly difficult for older people, who may experience isolation. That's a problem that some of Burlington's services, from the ELL class to the senior center, are increasingly striving to address. "Usually they are the first people to come to class," Alamatouri said of older refugee students, adding, "They work hard. They want to work hard." But he acknowledges that these learners take more time. In the reporting period between June 1 and September 30 of 2015, VRRP served 247 clients aged 51 or older — about 40 percent of the agency's total enrollment. Unlike most of her younger classmates — whose countries of origin include Somalia, Congo, Burma and Burundi — Monger doesn't have a job and spends most of her time at home or with her family. This means she has little interaction with those outside her immediate social network. Still, the Burlington resident wants to learn English so she can communicate with other people — for instance, answer the phone — when her son and daughter-in-law aren't around. ELL students learn what Alamatouri calls "survival English." For Monger and her classmates in the beginner class, the lessons include how to handle an emergency, the names of days and months, and writing and reading numbers from zero to 100. When Monger arrived in the Queen City from a refugee camp in Nepal, she didn't speak a single word of English. Today, the Bhutanese woman can write her name, give her address and answer simple questions. When Gov. Peter Shumlin visited the Ohavi Zedek class just before Thanksgiving — showing his support for the refugee resettlement program following the terrorist attacks in Paris — Monger was too shy to go up to him. But she was happy to introduce herself when the governor approached her. "Khina is very consistent," said Rainville, who has taught Monger for the past five years. "She's like a turtle. She just keeps at it. She takes her time, but she's precise about it." The nun remembered an incident that illustrated Monger's positive attitude. "I was trying to show them how to make the F sound. I had the students put their top teeth over their lower lip. Some of them did it. Khina said to me, 'No teeth.' She just laughed at herself," Rainville recalled. Monger was born in 1956 in the town of Sarbhang in southern Bhutan. Her parents died when she was a young child, and relatives raised her. Like many older Bhutanese, Monger doesn't know her exact date of birth. Accordingly, during the resettlement process, she was given a new birth date — January 1. Monger and her family were among the tens of thousands of Bhutanese of ethnic Nepali origin who were stripped of their nationality and expelled from their country after former king Jigme Singye Wangchuck implemented the "One Nation, One People" policy in 1988. His decree imposed the culture and religion of the local majority, the Buddhist Drukpas, on the Nepali settlers. Monger's family lived for about 18 years in a camp in Nepal, where she sewed blankets and clothes to make money. When the opportunity to resettle in the U.S. arose, Monger wasn't apprehensive. "I was only curious how to live there. But I was not worried," she said through an interpreter, Chandra Luitel. "There were so many tourists in Nepal. They were like us, too." It took her family 24 hours to travel from Kathmandu to Burlington, with stops in Abu Dhabi, Paris and New York City. Monger remembered arriving in Vermont: "We had so much snow that year," she said, wrinkling her nose. After her ELL class, Monger usually goes home to spend her days babysitting her grandchildren, visiting relatives, or watching Nepali comedies and movies on YouTube. "Sometimes I try to watch American shows, but I don't understand," she admitted. Wednesdays are different. On those days after her class, Monger walks to the Champlain Senior Center, located in the McClure Multigenerational Center on North Winooski Avenue, where she has lunch with her friends. She's among a core group of about 20 Bhutanese who show up every week. The senior center is open every weekday, but the Bhutanese come on Wednesdays because that's when Luitel is available to help them communicate with other seniors and the staff, said executive director Bonnie Campono. Though senior citizens are generally defined as 60 years or older, Campono said the lines are blurred within the Bhutanese community. When the Bhutanese started coming, about three years ago, the center "set aside a time, so they could have a room all to themselves. They didn't really have a place to meet and socialize," Campono said. But the goal of the gatherings, she stressed, is to encourage their integration and interaction with other seniors once they feel more settled. Monger said the facility provides a "tension-free" environment. "Some elderly people, when they stay at home, they think of previous days when they had their home and language. So, when they come here, they feel like they can talk, smile [and] laugh." Monger's daughter, Pabi, said her mother has developed a liking for pizza and chicken burgers because she's been able to try different cuisines at the senior center. The elder Monger also tries to practice making small talk with Campono — but, she said, "It's hard for me to remember." Recently, the senior center has begun expanding its efforts to promote cross-cultural awareness by putting up "word of the day" posters that teach visitors some basic Nepali. 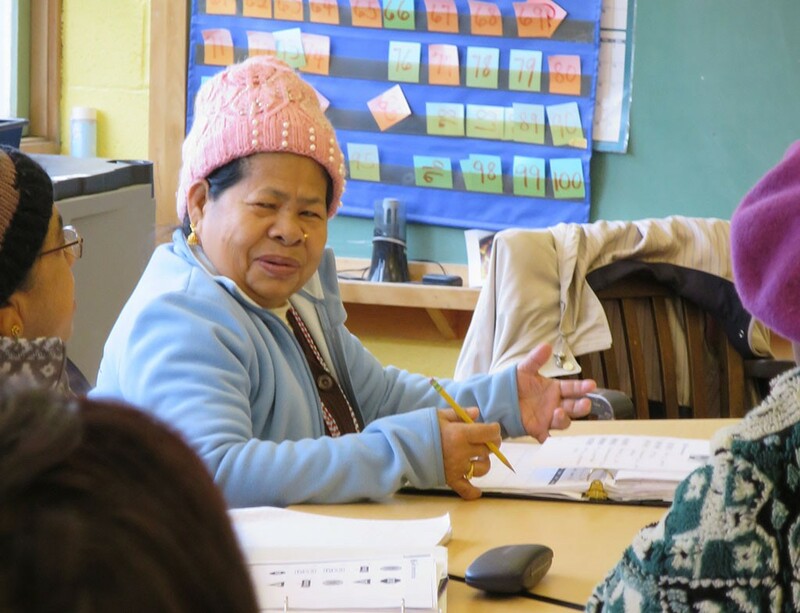 But Campono said what the Bhutanese really want is "English [class] right at the senior center," which is "really hard because there's no interpreter." Campono said other groups of all kinds have approached the center seeking a gathering place. "But what they want is a private space. The reason we gave the space to the Bhutanese was for integration." While the native-born seniors and the Bhutanese have needed time to adjust to one another, Campono said, she has seen the beginnings of that integration. These days, the Bhutanese men play bingo with English-speaking senior citizens, while the women tend to chat among themselves or stack Jenga blocks. Some Bhutanese and American-born seniors alike practice tai chi after lunch and get together for holiday dinners at the center. "There had to be time for the English-speaking Americans to feel respected, too," Campono said. "You should have a sense of involvement in the community. However, you shouldn't feel like the ownership belongs exclusively to you." Initially, some of the native-born seniors weren't comfortable with the newcomers, she acknowledged. Now, though, Campono said, "Most of our English-speaking seniors have truly come to appreciate the journey the Bhutanese have been on. The original print version of this article was headlined "Fitting In"